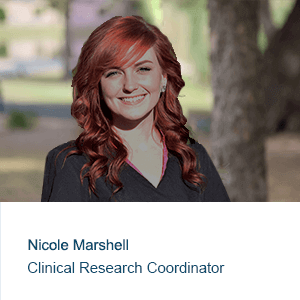 Nicole is a results-driven healthcare professional with over 9 years of experience in the research field having successfully completed over 140 clinical trials. As Clinical Operations Manager, she is responsible for executing clinical projects and research operations. Her excellent communication and team-building skills always lead to successful patient recruitment, marketing, and business development. 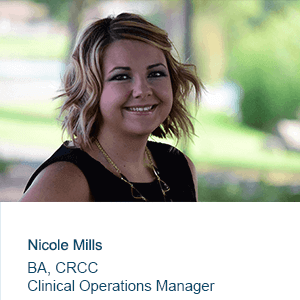 Nicole graduated from Arizona State University with a Bachelor of Arts in Human Health Studies in 2007 and is currently enrolled in Masters of Clinical Research Management with anticipated graduation in 2017. She is an active member of ACRP Phoenix Chapter, serving as President since 2015, and Vice President 2013-2014. Amanda Feczko joined FTC in 2012 with a wealth of knowledge and experience in the medical and research field. Prior to graduating nursing school with high distinction in 2011 where she also minored in biological sciences, she was nationally certified and registered as an Emergency Medication Technician. As a Registered Nurse she has worked in a variety of specialties including Neurological, Acute trauma/surgical care and fertility treatment. Amanda’s intense attention to detail and thoroughness make her a key asset to the PRG team. Amanda specializes in regulatory and FDA compliance as well as implementing and improving our quality assurance programs. Amanda is a true cowgirl at heart always looking to ride her beautiful horses in her free time. 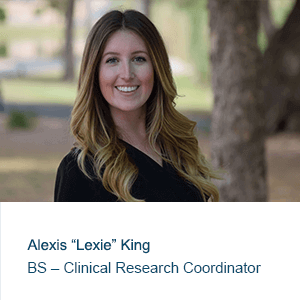 Lexie joined FTC after graduating from the University of Arizona in 2015 with a Bachelor of Science in Health Sciences. She is hard working, personable, and greatly enjoys helping others. After two years of intense local and international community service while at UofA, Lexie found amazing value in providing care to people in need. 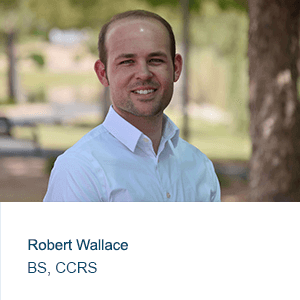 Clinical research has been a perfect fit where she is able to help patients find studies that will positively and directly impact their quality of life while providing data needed for pharma companies to produce new successful drugs. “Nikki” joined our research team in 2017 as a Clinical Research Assistant. A 2011 Medical Assistant graduate from Carrington College, Nikki was introduced to clinical research and found her passion. Over the past several years, she has successfully participated in over 45 studies. She was immediately drawn to our cross-functional research model to understand the mechanisms of disease biology and drug actions. 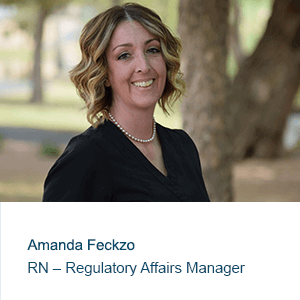 Her calm manner, attention to detail, and drive to be a part of identifying new medications and therapies make her a perfect addition to the our team.